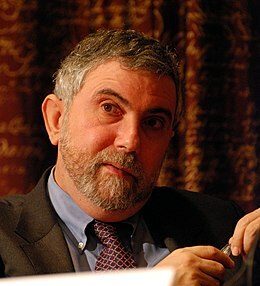 'S e eaconamaiche às na Stàitean Aonaichte a tha ann an Paul Robin Krugman. Rugadh e ann an Long Island ann an Eabhraig Nuadh, 28 an Gearran, 1953. Tha e na ollamh ann an Oilthigh Phrinceton agus tha e a' sgrìobhadh anns a' phàipear-naidheachd The New York Times cuideachd. Bhuannaich e an Duais Nobel ann an 2008. Air a tharraing à "https://gd.wikipedia.org/w/index.php?title=Paul_Krugman&oldid=537983"